Miss Boyle was employed in the First National Bank, Coaldale, until 1940, when she secured a position in the Chase National Bank, New York City. Margaret was employed as a clerk in Daley's Store until her marriage to Mr. James Timmony, September 14, 1927. Mrs. Timmony's children, Jimmy and Mary Catherine, are now pupils in St. Mary's. Cecilia chose the better part she is now Sister M. Nathaniel, I. H. M.
Since her graduation, Miss Fisher has been employed by the Pennsylvania Power and Light Company, Tamaqua. is married and now lives in Camden, N. J., where she was manager of the Woolworth Five and Dime Store. Mrs. Paul Kaltisko, who now resides in Lansford, Pa.
Miss McGeehan was a teacher in the Coaldale Public Schools before her marriage to Mr. Clifford Sweeney. She now resides in Philadelphia. After leaving St. Mary's, Gertrude studied nursing at the Misericordia Hospital, Philadelphia. It was at this hospital that she practiced until her marriage to Mr. William Daley. She now resides in Philadelphia. Before marrying Mr. Robert Simonds, Kathryn was a teacher in the Coaldale Public Schools. Loretta was first employed as housekeeper at St. Canicus' Rectory, Mahanoy City. Following this she secured a position at the Coaldale Mill until her marriage to John Culbert. She now resides in Elizabeth, N. J. At present she is the organist at St. Mary's Church and resides with her mother on Water Street. Winefred is known among the "chosen" few as Sister M. Andrea, 1. H. M.
After graduating from St. Mary's, Miss Ryan was employed by the Panther Valley Water Company. She then married Mr. William Redgate. Dr. Hollywood studied medicine at the Jefferson Hospital, Philadelphia. He is now married and practicing in Jersey City. Mr. Melley, who attended Penn State, received his A. B. at that College. Later he entered N. Y. U. where he received his M. A. He is now head of the Science Department at the Coaldale High School. Mr. Mundy was employed for eight years by Andrew Breslin, contractor, of Summit Hill. He then worked for the Central Railroad of New Jersey in Mauch Chunk, and is now engaged as an Engineer by the W. P. A. Since his graduation, James is employed as a coal inspector for the L. N. C. Company. After graduating from St. Marq's, Kenneth attended the Philadelphia PreMedical School for two years. He also graduated from Mt. St. Mary's and Temple University. Following this he served in the U. S. Army for eight years and is now employed in the Philadelphia General Hospital. Miss Barrett has been employed by the Panther Valley Water Company since her graduation. married Mr. Francis X. Kelley and she now resides in Pottsville. Miss Hoben resides with the family on Ruddle Street, Coaldale. was employed at the office of Doctor W. C. Scott, Lansford. married Mr. John Murphy, of Tamaqua. was manager of the American Stores in Lansford for 14 years. Cecilia is now employed in the Acme Market in the same town. is employed in the office of Doctor Kelley, New York City. married Mr. Jerry Devlin. After residing in Coaldale for several years, they moved their place of residence to New York City where Mr. Devlin is employed. Departed this life. May he rest in peace. After graduating from St . Mary's, Stephen entered in St. Charles' Semi nary and was ordained in 1931 in Ss. Peter and Paul's Cathedral, Philadelphia. After serving as assistant pastor for several years, he was appointed rector of St. Stephen's Church, Shenandoah. attended Mount St. Mary's College, Emmitsburg, Maryland, and Temple University. He is now employed by the L. N. C. Company. has had a very successful business career. He is now President of. the United States Book Cover Company, Tamaqua. Francis, the Valedictorian of his class ' attended St. Charles' Seminary Overbrook, for four years. He was then appointed to finish his studies at Pontifical Roman Seminary, in Rome. He was ordained by His Eminence B. Cardinal Pompili, on March 15, 1930, and read his first Mass at Rome in St. John Latern Church the following day. He read his first Mass in America in St. Mary's Church on August 10, 1930. He served as secretary to Cardinal Dougherty for six years, and was then appointed President of Immaculata College. Helen married Mr. Charles McCue, a builder and contractor of Philadelphia. Miss McGeehan resided with her mother until her marriage to Mr. Clark Mundy. Married Thomas Rawle. Her son, Thomas, Jr., attends St. Mary's. Departed this life. May she rest in peace. Studied at West Chester State Teachers' College, taught in the Coaldale Public Schools, and then chose the better part she is now Sister Marian Gertrude 1. H. M.
who entered the 1. H. M. Community, is now Sister M. Leander. Sue attended Pierce Business School in Philadelphia. She was employed at Bright's until her marriage to Mr. James Devers, June 22, 1927. Mr. Cullen has been employed at the No. 11 and No. 9 Collieries of the L. N. C. Company. Lived in Coaldale until 1925. He was employed by the P. P. & L. Company, and is now Division Auditor at Shenandoah. Paul, a Pennsylvania State Policeman, is stationed at Wyoming Barracks. now resides in Wilkes Barre and is employed in one of the leading drug stores in that city. Miss Gildea was Treasurer of her class. After graduating she took up hair dressing in Philadelphia, and since then she has operated a beauty shop on Phillip Street, Coaldale. was employed as a private secretary in Harrisburg until her marriage to Mr. William Grey. She now resides in Hummelstown. studied at West Chester State Teachers' College, taught in Blythe Township High School, and then entered the L H. M. community where she is now known as Sister Innocentia. was empployed by, the Carbon Telephone Company until her marriage to Mr. William Kehoe. Mrs. McCarthy now resides in Philadelphia. married Zita O'Donnell, of Tamaqua, and now resides in Philadelphia. was employed by the A & P stores at Lansford. He is now married and resides at Catasauqua. After graduating, David was employed at the Hauto Power Plant and the No. 7 Office. He is now employed at the Coaldale Colliery. After graduating John entered St. Charles' Seminary, Overbrook, and was ordained to the priesthood on May 26, 1934. He died on February 10, 1938, while serving as assistant rector of St. Louis' Church, Yeadon. was president of the Alumni for two years. He is now employed on the clerical force in the Lansford Shops, where he has worked for 18 years. Married Stephen Zaleha. She now resides on West Phillip Street, Coaldale. Now Mrs. Leo McTague, and resides in Allentown. 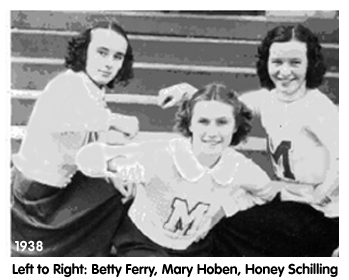 Following a three year course , Mary graduated with the Class of 1923. She returned in September, 1924, resuming her studies as a fourth year student. She again graduated with the Class of 1925 with a complete high school course. Mary now resides in Wilkes Barre, Pa.
After graduating from St. Marys, Dorothy attended Immaculata College, where she received her A. B. degree. She is now employed in the J. C. Bright Department Store, Lansford. Attended the Catholic University of America. He is now a Sergeant in the United States Army. Graduated from Villanova College. At present John is married and teaching in New York City. Attended St. Charles Borromeo Seminary, where he perused studies for the priesthood. Father Melley was ordained in Ss. Peter and Paul's Cathedral, Philadelphia, and at present he is stationed at St. Stephen's Church. Philadelphia. Attended Georgetown Law School where he received a Doctor Degree in Law. At present he is employed in Washington, D. C.
Graduated from Philadelphia College of Pharmacy. He is now married and operates a Drug Store in Tamaqua. After graduating from St. Marys, Mary married Mr. Alex Sekella and now lives on East Water Street. After graduating from St. Mary's, where she was Valedictorian of her class, Mary received her A . B. degree from Immaculata College. She then attended Temple University and N. Y. U. She received her M. A. from the latter. She is now a teacher of Mathematics in the Coaldale High School. After graduating, she was employed as a relief inspectress in Pottsville. She was recently appointed secretary of the Tamaqua Tire Rationing Board. Miss McGeehan resides in Coaldale. Graduated from the University of Pennsylvania. She is now married and resides in Chicago. Jean married Mr. Ted McGorry and resides in Nesquehoning. Since graduating from St. Mary's, Anna has been employed at Bright's Department Store, Lansford, where she is now head of the Household Department. Graduated from St. Joseph's College, Emmittsburg, Maryland. She was a Dietition in the Coaldale State Hospital for several years and now resides in Philadelphia. Rose married Mr, John Drosdak. They now reside on East Phillip Street Coaldale. Alex is a resident of Coaldale and is employed by the L. N. C. Company. Immediately after graduating, Mr. Furey opened Furey's News Agency, a shop which he now operates on Fisher Avenue. He is also affiliated with the Metropolitan Insurance Company. Maurice, who resides in Chester, is employed by the Baldwin Locomotive Company. After graduating from St. Mary's, Kathryn attended St. Joseph's College, Emmittsburgh, Maryland, and Penn State College. She also studied at N. Y. U. Miss Cavanaugh is now a teacher of Latin in the Coaldale High School. She was employed in the office of the P. P & L. Co. in Tamaqua until her marriage to Mr. Thomas McGorry, Nesquehoning. Anna was married to Mr. James McCartney and now resides on East Ridge Street. Her children, George and Alice Ann now attend this school. Graduated from Villanova and now resides in New Jersey. Is employed with the L. N. C. Co.; and resides with his parents on Ruddle Street. Mary graduated from Temple University as a Dental Hygienist. She is married to Frank Valentine and lives in Lansford. Hospital and then went to Rosenkrans Hospital, Stroudsburg. She is now doing private duty at Coaldale. 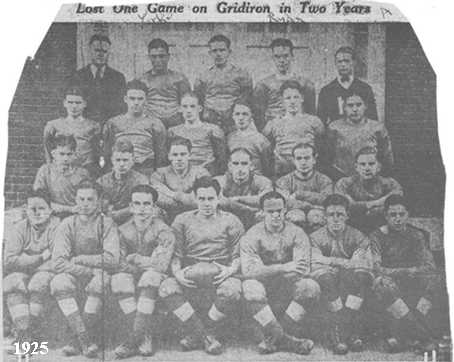 Entered Immaculata College in 1928 and finished in June 1932. She is now a substitute teacher in the Coaldale Public Schools. Resides with her mother on Second Street, Coaldale. Received her A. B. degree from Immaculata College. Also attended N. Y. U. 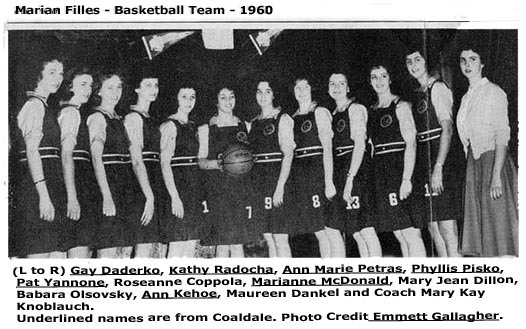 Taught in the Coaldale High School until she married Dr. James McShean of Norristown. Marcella resides in Norristown. Was graduated from Bloomsburg State Teachers College and taught in the Blythe Township High School. Is married and resides in Coaldale. His son attends St. Mary's. Graduated from Mt. St. Mary's. Resides in Coaldale. Was engaged by Mack Truck Corporation in Allentown, where he now resides. Departed this life in 1933. May he rest in peace. Was the manager of the Summit Hill A. & P. Store for several years after graduating from St. Mary's. At present, Mr. Mundy is an automobile salesman in Lansford. James studied at St. Charles' Seminary, Overbrook, and was ordained to the priesthood in Ss. Peter and Paul's Cathedral. Father Yorke is now a teacher of Science in the Roman Catholic High School, Philadelphia. Received his A. B. degree at Penn State College, and studied law at the University of Pennsylvania. He is now practicing in Pottsville. Trained at St. Joseph's Hospital. She is now a registered nurse at Philadelphia. Rose studied at the School of Dentistry, University of Pennsylvania. She graduated as a Dental Hygienist, and taught in the Pottsville Public Schools for several years. John is now living in Islen, N. J.
Resided for several years on First Street, Coaldale. After her marriage to Mr. Joseph Sheean, she made her home in Philadelphia. George is married and resides in Coaldale. Marie was graduated from Immaculata College. Then she married Mr. Joseph Keenan and now resides in Tamaqua. Is employed by the L. N. C. Company, at Coaldale. Married Mr. Joseph Balazovic, and now lives on Water Street, Coaldale. Is employed as a Telephone Operator by the Carbon Telephone Company. She is now living in Lansford. Is employed as a teacher in Washington, D. C.
Agnes attended Pierce Business School, Philadelphia. Later, she was employed at the Coaldale Hospital for four years. (Mary Deane) is now a private nurse. She resides in Philadelphia. After she graduated, Ida married Mr. M. Dillon. The couple reside in New York. Is married and lives in Tamaqua. Married Mr. J. D. Yeso, and now resides in Everett, Massachusetts. Resides with her father on High Street, Coaldale. Is now Mrs. Edward McHale. The couple reside in Tamaqua. Previous to his induction into the U. S. Army, Mr. Cullen was a sales¬man. He is now a First Class Private. Is now a Corporal in the U. S. Army. Formerly he was employed by the L. N. C. Company. Is employed by the P. P. & L. Company. LeRoy is married and living in Lansford. At present, Robert is working at Wilmington, Delaware. Joseph is married and resides on High Street, Coaldale. He is employed as an insurance agent. Francis is now one of Uncle Sam's Privates. reside in Harrisburg, where Mr. Foley is employed by the American Oil Company. Entered St. Joseph's Training School for nurses. She is now a registered nurse in Brooklyn, N. Y.
Mary received her A. B. degree from Immaculata College. She was employed by the Treasury Department, Harrisburg, until her marriage to Mr. John Phillips, Tamaqua. Nancy graduated from Kutztown Teachers' College. She is now County Supervisor of Libraries. Grace trained at St. Joseph's Hospital, Philadelphia. Attended West Chester State Teachers' College and New York University. Helen is now Music Supervisor in the Coaldale Public Schools. After graduating, Cecilia married Mr. Frank McHugh. Attended St. Mary's of the Woods, Indiana. She is now employed at Harrisburg. Is now Mrs. Duffy, and resides in New York City. Sergeant at Meridian Air Base, United States Army. William enlisted in the Air Corps and is now stationed in Newfoundland. Is now married and resides in Hometown. He is employed by the L. N. C. Company. After graduating from St. Mary's, Joseph entered St. Charles Borromeo Seminary, Overbrook. He was ordained to the priesthood in Ss. Peter and Paul's Cathedral, Philadelphia, in June, 1940. Father is now assistant rector of the Sacred Heart Church, Phoenixville, Pa. Graduated from Stroudsburg State Teachers' College. She then became Gym Teacher at the Coaldale High School. Margaret is married and resides in Stroudsburg. Was Secretary to Michael J. Clark, Tax Collector, for several years. She was also employed at the Sears, Roebuck & Co. Store, Lansford. Marie is married to Stephen Radocha. Attended Columbia University. She was then employed in the Treasury Department, Washington, D. C. Kathleen married Daniel Malloy, also of the Class of '32. Catherine graduated from St. Joseph's College, Emmittsburg, Maryland. She now resides with her mother on East Water Street, Coaldale. Anna Mae married Mr. Fred Howells, of Tamaqua. The couple now re¬sides on First Street, Coaldale. Is now Mrs. O'Riley. She resides in Pottsville. Mary is working and resides with her mother on High Street, Coaldale. Grace is known among the "chosen" few as Sister Maria Sancta, 1. H. M.
Graduated from St. Bonaventure College. 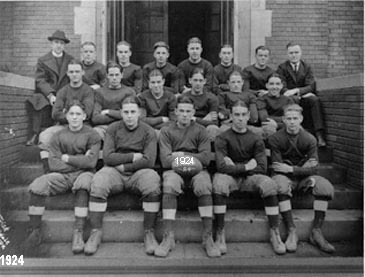 At present he holds a position as teacher at Aristes High School, Aristes, Pa.
Washington, D. C. Daniel married Kathleen Burns, also of the Class of '32. At present James resides on Third Street, Coaldale. Charles is married and resides in Coaldale. Department Store. He is now married and resides in Baltimore, where he is employed. Richard did Secretarial work for the American Trucking Association in Washington, D. C., before his induction into the U. S. Army. Resides at home in Coaldale. A private Nurse in the Coaldale State Hospital. Registered Nurse located in Doctors' Hospital in New York City. Resides at her home on High Street, Coaldale, Pa.
Resides at her home on Second Street, Coaldale. Enlisted in the U. S. Army as a Nurse. At present, Mary is located in Texas. Received her A. B. degree from Mt. St. Vincent's on the Hudson. Holds a Secretarial position in New York. Registered Nurse in the Pottsville Hospital. Married and resides in New York. Married to Mr. Johnson and resides in Tamaqua. Married to Mr. Brennan and resides in Allentown. Telephone Operator. She resides with her parents on Water St., Coaldale. Works in the Electric Department of the No. 7 Shops. Is an electrician for the P. P. & L. Is married and resides in Coaldale. Employed by the Atlantic and Pacific Company. Employed by Ted Rodgers, Washington, D. C.
Employed by the U. S. Postal Service in Coaldale. Is married and resides in Bristol. Employed by the Baldwin Locomotive Works in Chester.. Employed by the Pennsylvania Turnpike at Harrisburg. Works for the Coaldale Borough. Margaret trained in St. Joseph's Hospital, Philadelphia, and is now a nurse in the Coaldale State Hospital. Will be married to Larry Foley on June 10, 1942. Margaret is head Librarian in the Coaldale Public Library. Marie married Mr. William Pislak, and now resides on First Street,Coaldale. Is a graduate nurse of the Jefferson Hospital, Philadelphia. She is now nursing in the Coaldale Hospital. Mary married Mr. Frank Urban and resides in Coaldale. She is employed in the Branch Office of the Allentown Morning Call, Lansford. Marjorie received her A. B. degree from Immaculata College. She is now employed at Washington, D. C.
Joseph is married and resides in Coaldale. He is employed by the L. N. C. Company. Robert received his A. B. degree from St. Bonaventure College. He began his studies for the Franciscan Order in Patterson, N. J. He is now attending the Holy Name College, Washington, D. C. Robert will be ordained to the priesthood in 1942. Is married and resides in Coaldale. Patrick is employed by the L. N. C. Company. Is married and resides in Chester where he is employed at the Baldwin Locomotive Works. Daniel is married and lives in Nesquehoning. James resides with his mother on Second Street, Coaldale, and is em as a coal inspector at the No. 14 Colliery. Joseph resides in Coaldale and is employed by the L. N. C. Company. Charles was employed as a wine steward in the Silver Lounge of the Marlborough Blenheim Hotel, Atlantic City, N. J., until his induction into the United States Army. He is stationed in South Carolina. Before entering the Army, he attended an Aircraft Mechanic Training School at Andreas Airport. On May 21, 1941, he enlisted in the U. S.
Army Air Corps. His present ambition is to further himself in Aviation. Is married and employed at the Atlas Powder Plant in Ravena, Ohio. Margaret Mary held a State position in Harrisburg until her recent marriage to John Early. Vera worked in the Coaldale Mill for several years. She married Mr. Rob¬ert Scutta and now lives on Ridge Street, Coaldale. Elizabeth is now nursing in the Kings County Hospital, New York City. John was the Valedictorian of his class. He is now studying for the priest¬hood at St. Charles Borromeo Seminary, Overbrook. Has secured a position in Washington, D. C.
Was employed in Washington before his induction into the U. S. Army. McHugh on June 10, 1942. Jimmy is studying law at Fordham University. We are pleased to learn hat he just passed the examination to practice at the Bar. Jimmy is employed in Washington, D. C.
Leo resides with his mother on High Street, Coaldale. He is employed by the L. N. C. Company. John, who was inducted into the Army recently, is stationed in Texas. Frank works in an office in Washington, D. C.
Thomas attended Notre Dame University. He is married and lives on Ridge Street, Coaldale. Tom is now employed by the P. P. & L. Company at Hauto. Was employed by the L. N. C. Company before his induction into the U. S. Army. Was recently inducted into the U. S. Army. Has secured a position in Bethlehem. He is married and resides in that city. Attended Kutztown State Teachers' College and is now a substitute teacher in Coaldale Public Schools. Studied at Strayer's Business College after graduating from school, and is now working for the Mallinckrodt Firm in Philadelphia. Entered training in the Misericordia Hospital and is now employed as a Private Nurse in the Fitzgerald Mercy Hospital, Darby. Began her Medical career as a student nurse in the Sacred Heart Hospital, Allentown, Pa. Miss Bell is now serving her country in the Medical Section of the U. S. Navy. At the end of her High School career at St. Mary's High School, Miss Prokop moved to Bethlehem and secured a position. Julia is now married and living in New York. Miss Duffy is now employed by the War Department in Washington, D. C. She was Valedictorian of the Class of '36. Commenced her studies at the St. Agnes' Hospital. She is now a member of the Doctor's Hospital, at Philadelphia. James is employed at the K. & K. Auto Parts Shop in Tamaqua. After school each night, James worked in Lewis' Gas Station on Third St. He is now employed at the Corriel Strippings, Reevesdale, Pa.
Is now serving in the United States Army. Married Mr. Walter Holmes and resides in Norristown. Was employed in the American Trucking Association, until his induction into the Army. Received his A. B. degree from Penn State College. Jimmie was employed at the National Bank of Coaldale until his induction into the Army. After graduating, Margaret obtained the position as secretary to Mr. Ted Rodgers of the American Trucking Association, and resides in Washington, D. C.
Was a nemployee of Bright's Department Store before her marriage to Mr. Thomas Dillion and now resides in Tamaqua. After graduating from McCann's Business School, she obtained a position in the N. Y. A., Pottsville Post Office. She is now working in Washington, D. C.
Attended St. Joseph's College, Emmittsburg, for one year. Entered St. Agnes' Nursing School, Philadelphia, and then transferred to Mt. Sinai, New York. Received an A. B. degree from Immaculata College, and is employed by a food firm in New Jersey. Resides with her parents on Water Street. Is employed by the Glen L. Martin Co.
Married to Mr. Peter Schmauch. She now resides in Baltimore. Received his A. B. degree from Stroudsburg Teachers' College. He has a position with the P. P. & L. Co., in Lancaster. Specialized in the field of Dietetics for T. B. Patients in New Jersey. One year in Philadelphia General Hospital. Was employed in the service of Dr. Ditchey, Tamaqua, until her mar¬riage to Mr. Frank Rajnic. They reside in New York. Employed by the Coaldale Borough before induction into the Army. Took up Commercial Art at night in a New York School. Is now employed in New York. Who was Valedictorian, chose better part and entered the Novitiate of Sisters of St. Cyril and Methodist at Danville. She is now known as Sister Paulita. Graduated as nurse from St. Agnes' Hospital. Received R. N., and now is employed on General duty at the Coaldale Hospital. Graduated from St. Joseph's, Philadelphia. Received R. N. and is now practicing at the Warne Hospital in Pottsville. Received her B. S., Home Economics, at Immaculata College. Now teaching Home Economics in the Coaldale Public School. Attended Seton College in Greensburg, Pa., for one year. Mary married Mr. Frank Gulla and is residing in New York. 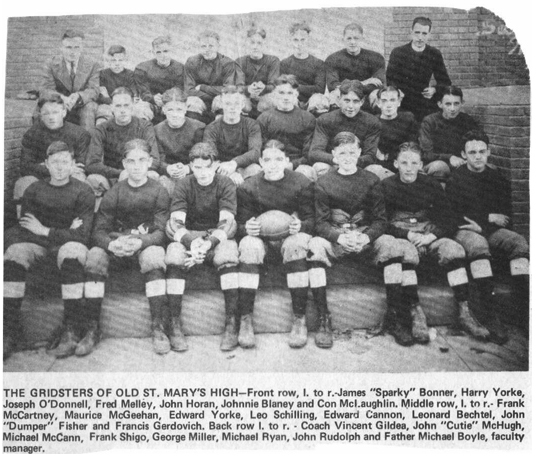 After leaving St. Mary's, he coached the Basketball Team of his Alma Mater for two years. Then he was inducted into the armed forces of the U. S. He trained at Camp Wallace Texas, for eight months, and is now stationed at Key West, Florida. Resided at his home on Phillip Street, until several months ago, when he enlisted in the Air Corps. He is stationed in Illinois. Paul attended Niagara University for one year. Then he entered the Franciscan Novitiate at Paterson, N. J. Paul is now studying for the priesthood. After graduating from St. Mary's, Michael entered the Novitiate of the Congregation of the Missions, Germantown, Pa.
After graduating from McCann's Business School, Mahanoy City, Betty secured a position as Secretary in Harrisburg. After graduating from St. Mary's, she secured a position as bookkeeper at the United Mine Workers' Office. Miss Breslin is now secretary to Mr. T. J. Kennedy, Washington, D. C.
Miss Sheerin attended McCann's School of Business, Mahanoy City, for one year. She is now employed by the government in Washington, D. C.
Will receive her degree from Immaculata College in May She is Editorin chief of the "Immaculatan", school paper of the College. Catherine is a graduate nurse of St. Joseph's Hospital, Philadelphia. She is now taking up a special course at the Wills Eye Hospital, Philadelphia. Pauline is a graduate nurse of the Sacred Heart Hospital, Allentown. She is now employed in that city. Miss McHugh is working in the Unemployment Office in Tamaqua. Is now living in Norristown. In training at the Sacred Heart Hospital in Allentown, Pa. Employed at the Home Maid Ice Cream Parlor. Is now in training at the Sacred Heart Hospital in Allentown, Pa.
Is employed at the Coaldale Hospital. Employed as a Clerk at Tobel's in Tamaqua. Attended McCann's Business College and is now employed at Harrisburg. Was employed by the L. N. C.
Joined the U. S. Army immediately after he graduated from St. Mary's. He is now a Sergeant in the Army. Was employed by the Government in Washington, D. C. He is now in the Naval Reserves. Attended training school at the Lansford Shops and is now employed by the Baldwin Locomotive Works at Glen Olden, Pennsylvania. Attended Aircraft School at Andreas, Pa. Is now employed at the Glenn L. Martin Aircraft Corporation. Employed by the Curtis Wright Airplane Plant in New Jersey. Is attending St. Joseph's College, Princeton, N. J. Edward is to enter the Congregation of the Missions to become a priest. Is employed by the L. N. C. and resides in Coaldale. He attended the Lansford Shops and took a course as, machinist. He received a position at the Baldwin Locomotive Works. Resides in Glen Olden. He went to N. Y. A. in Andreas; he then received a job as a welder in the Glen L. Martin Defense Plant in Baltimore, Md. After graduation, Leonard obtained work at the Johnson Service Station in Tamaqua. Worked at Fegley's Service Station for a few months but is now employed in the Coaldale A. & P. Store. John O'Donnell Was employed by the Government in Harrisburg. He is now employed at Middletown as an interviewer for the Government. Employed by the L. N. C. Co., and resides with his parents on Ridge Street, Coaldale. John has been ill for the past year and is still unable to work. A year ago, Mr. Gildea won a scholarship from L. N. C. to Penn State. He is now taking a course in Mine Engineering. He took a course in Diesel Mechanics, was in the trucking business for two years, worked in the Ace Manufacturing Company, and is now working for the Fleet Wing Aircraft Co., in Bristol. Is working for the Government in Harrisburg. Resides at home with her father. Miss Bonner was enrolled in St. Francis' Hospital, but changed her mind. She now has other plans. Mary worked on the N. Y. A. since she left school. Recently she obtained a position with the War Department in Washington. Miss Hoben is now keeping house for her father. She intends to enter the Convent in September. She is a student nurse at St. Francis' Hospital in Wilmington, Delaware. Entered a Business School in Pottsville. Now she is employed by theAllentown Morning Call in Lansford, Pa.
Won a scholarship to Immaculata College, Philadelphia. Was employed on the N. Y. A. in the Coaldale Hospital. Now she is working in Bridgeport, Conn.
Is employed in the office of Bright's Department Store as Bookkeeper. Is employed by the N. Y. A. Miss Boyle contemplates training for R. N. in September. Is a student in training at Jefferson Hospital, Philadelphia. Discontinued training at St. Joseph's Hospital, Reading. She now resides at home. Employed on N. Y. A. Took up a Defense Course at Andreas. Now he is employed as a riveter at Glenn L. Martin Defense Plant, Baltimore, Md. Took up a Defense Course at Andreas. He is now employed as a riveter at Glenn L. Mar tin Defense Plant, Baltimore, Md. Took up A Defense Course at Andreas. Now employed as a riveter at Glenn L. Martin Defense Plant, Baltimore, Md. Won a scholarship to St. Bonaventure's College, N. Y. Is now employed as Advertising Manager by the Coaldale Observer. Is taking up electrical work in the Lansford Shops. Took up a Defense Course at Lansford Shops. Now employed as machinist at Baldwin's Defense Plant, Philadelphia, Pa.
Secretary of the Athletic Association. Favorite Expression; Were you excited? Favorite Song: Wherever You Are. Member of the Dramatic Club. Favorite Song: Someone's Rocking My Dreamboat. Ambition: To become a nurse. Secretary of Catechetical Discussion Club. Favorite Expression: Jennie, are you going to the dance Sunday night? Ambition: To become a nurse in Catholic Hospital. Favorite Expression: Where are you going tonight ? Favorite Song: Blues in the Night. Favorite Expression: What time is it? Favorite Song: Remember Pearl Harbor. Favorite Expression: Oh, it's you again! Favorite Song: We'll Meet Again. Ambition: To become an A 1 Secretary. Member of the Sen Jun English Club. Favorite Expression: Oscar, is it 3:15? Favorite Song: The Automobile Song. Ambition: To get one shot at Hitler. President of the Athletic Association. Favorite Song: Tippy, Tippy Tin. Member of the "Bona Fide" Debating Club. Favorite Expression: Where were you? Favorite Song: High on a Windy Hill. Ambition: To become champion boxer. Favorite Song: Rock and Rye Polka. Ambition: To become a Defense worker. Business Manager of "Per Annos". Favorite Sport: Selling horse numbers. President of the "Bona Fide" Debating Club. Favorite Expression: Good boy, Dizzy. Favorite Song: Alexander, the Swooce. Ambition: To own a Service Station. Favorite Song:, Wearin' of the Green. Ambition To become an air raid warden so at I can be outside during an air raid. Vice President of the Athletic Association. Ambition To wipe out all the Japs. Favorite Expression: Where are you going? Favorite Song: You Are My Sunshine. Ambition: To become a carpenter. Favorite Expression: Wait a minute! Favorite Song: Don't Sit Under The Apple Tree. Member of the Inter mural Debating Team. Favorite Song: Story of a Starry Night. Ambition: To become Secretary to an important business executive. Vice President of the Class of '42. Favorite Expression: Well, what do you know? Favorite Song: Hats Off To MacArthur. Favorite Song: Shrine of St. Cecilia. Cheerleader of the Basketball Team. Favorite Song: This Love of Mine. Ambition: To become a millionaire. Favorite Expression: Do you feel lucky ? Ambition: To become a teacher of music. Member of the Catechetical Discussion Club. Favorite Expression: You're not kidding. Member of the S. M. H. S. Basketball Team. Favorite Song: You Made Me Love You. Ambition: To become a blue print designer. Favorite Song: The Anniversary Waltz. Ambition: To become a clerk in the A. & P. Store. Favorite Expression: Get about your work. Favorite Song: White Cliffs of Dover. Ambition: To become an electrician. Favorite Expression: What do you know? Favorite Song: Deep in the Heart of Texas. Favorite Subject: Chemistry. Ambition: To become an aviator. Favorite Expresssion: I need the money. Captain of the JV Basketball Team. Ambition: To operate a Bakery Route. Favorite Expression: Oh, you idiot. Ambition: To become an athletic in¬structor. Assistant Business Manager of "Per Annos". Ambition: To attend graduation exercises at Notre Dame. Favorite Expression: I won't know how to act. Favorite Song: Somebody Else Has To Take My Place. Member of the "Mother Seton Club". Favorite Song: String of Pearls. Favorite Expression: Oh! Goody; Goody. Hobby: Collecting various kinds of perfume. Member of the Semper Bonus English Club. Favorite Song: Somebody Else Is Taking My Place. Member of the Mother Seton Club. Favorite Song: Sing a, Song of the Island. Favorite Song: Chattanooga Choo Choo. Favorite Expression: O, Yes, sure. Favorite Song: Good bye Mama. Favorite Expression: O My Lands! Member of the "Semper Bonus English Club". Favorite Expression: I know you are. Favorite Expression: Tell Me Another One. Favorite Expression: Are you happy? Vice President of the "Semper Bonus English Club. Member of the Semper Bonus English Club". President of the "Semper Bonus English Club". Favorite Song: Twenty one Dollars a Day Once a Month. Favorite Song: Deep in the Heart of Texas. Ambition: To become a reporter. Ambition: To become an insurance salesman. Ambition: To make or fly airplanes. Favorite Expression: Aw Go On! Vice President of Freshman Class. Favorite Expression: O forget it! Ambition: To become Wallenstien II. Favorite Expression: Never, Never, Never! Ambition: To become a TWA pilot. Ambition: To become a pilot. Favorite Expression: Are you coming? Favorite Song: Happy in Love. Ambition: To become a song writer. Treasurer of the Mother Seton Club. Favorite Expression: You'll be sorry. Favorite Song: I Don't Want ToWalk Without You Baby. Ambition: To become a secretary. Member of the "Semper Bonus" Club. Favorite Expression: How do you do? Ambition: To become a stenographer. Member of the "Mother Seton" Club. Favorite Expression: What are you dictating ? Favorite Expression: Why sure, I'll do that! Secretary of the Class of 1945. Favorite Expression: Is everybody happy? Favorite Song: Magnolias in the Night. Ambition: To become a girl reporter on a large newspaper. Favorite Song: The White Cliff s of Dover. Favorite Expression: Heavens above! sion: Oh! My stars! Favorite Expression: How is everyone? Favorite Expression: Oh! My stars! Favorite Song: The Shrine of Saint Cecilia. Ambition:To become a teacher of Horne Economics. Treasurer of the Freshman Class. Favorite Expression: You villain, you! Favorite Song: Beer Barrel Polka. Cecilia Cannon ¬ Sister M. Nathaniel, I. H. M.
Winfield O'Brien ¬ Sister M. Andrea, I. H. M.
Rev. Francis Furey D. D.
Winifred Melley ¬ Sister Marian Gertrude, I. H. M.
Kathleen O'Brien ¬ Sister M. Leander I. H. M.
Hannah McElhenney ¬ Sister Innocetia, I. H. M.
Grace Rodgers ¬ Sister Maria Sancta, I. H. M.
Sister Anna Jean, I. H. M.